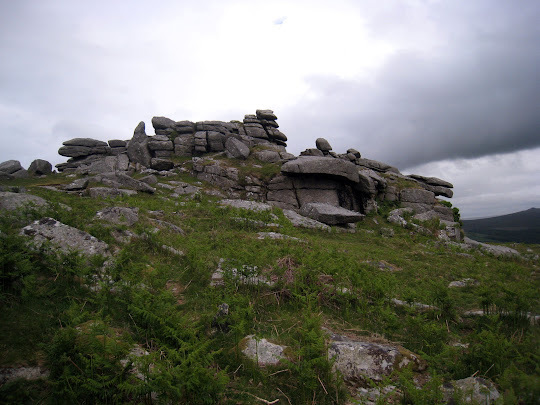 DARTMOOR NATIONAL PARK, England — Shortly after we became involved in letterboxing three years ago, we learned about England's legendary Dartmoor National Park, the birthplace of letterboxing in 1854. Having cut our letterboxing teeth exclusively on 21st century boxes, we were in awe. The oldest letterboxes in the U.S. date back only to 1998, and there are only a handful of those. We were determined to make a pilgrimage to Dartmoor where our fascinating hobby was born. After postponing this journey twice, today we finally trekked to the park of parks to begin our search for letterboxes extraordinaire. When searching for letterboxes in the U.S., one obtains clues to locate the boxes from several web sites. Under "Dartmoor rules," letterbox clues aren't so easily available. 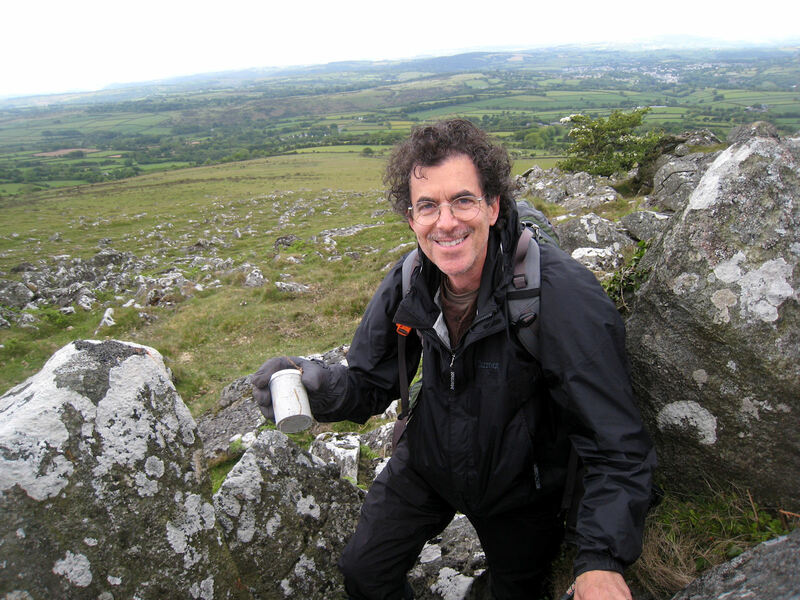 Dartmoor letterboxers distribute their clues in a printed catalog which is updated annually. However, to be eligible to purchase the catalog, one must provide proof of having already located 100 letterboxes on Dartmoor. Without clues, we resorted to the tried and true method most people use to find their first Dartmoor letterboxes— scavenging. Occasionally we have used this procedure in the U.S. when the clue provided for a box was imprecise or confused left with right, but we call it the dummy method. Scavenging on Dartmoor usually involves searching under, between, or behind rocks. And does that park have rocks! The letterbox is under the rock. 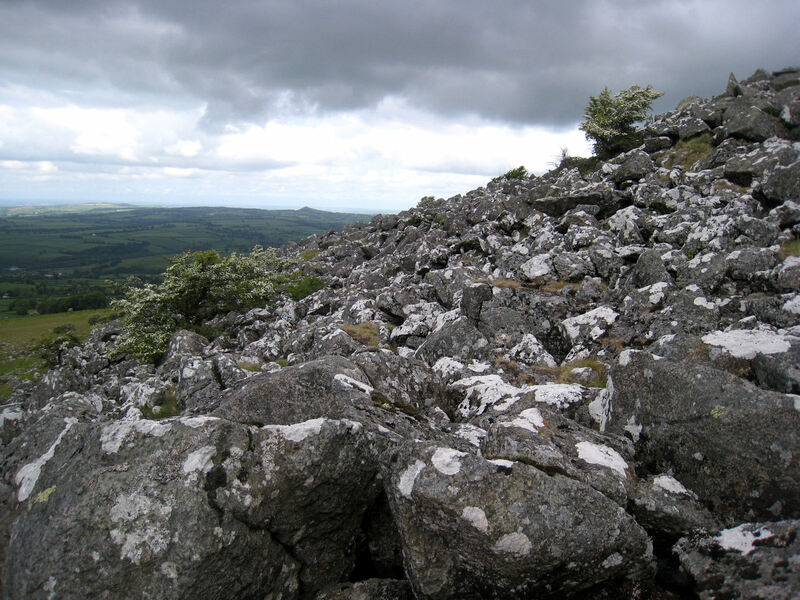 In Dartmoor's 368 square miles, there are almost 200 tors-- hills topped with outcrops of rock, usually granite in the form of rounded boulder-like formations. So when the Dartmoor gurus advise checking around rocks, it's a daunting task. Our first scavenging location today was Cox Tor with an elevation of 1,450 feet. We had been scavenging for about an hour when Ken found our very first genuine Dartmoor letterbox. What a thrill! This was the moment we had been waiting for more than two years. Encouraged, we stamped in and continued searching. And searching. And searching. Two hours later all we had found were two stray and ruined logbooks, three empty boxes, fragments of four more boxes, and one geocache. We took a break for lunch and pondered our lack of success. After some nourishment, we picked ourselves up, dusted ourselves off, and made our way to Pew Tor (elevation 1,033 feet) , which has a reputation as an area heavily populated with letterboxes. 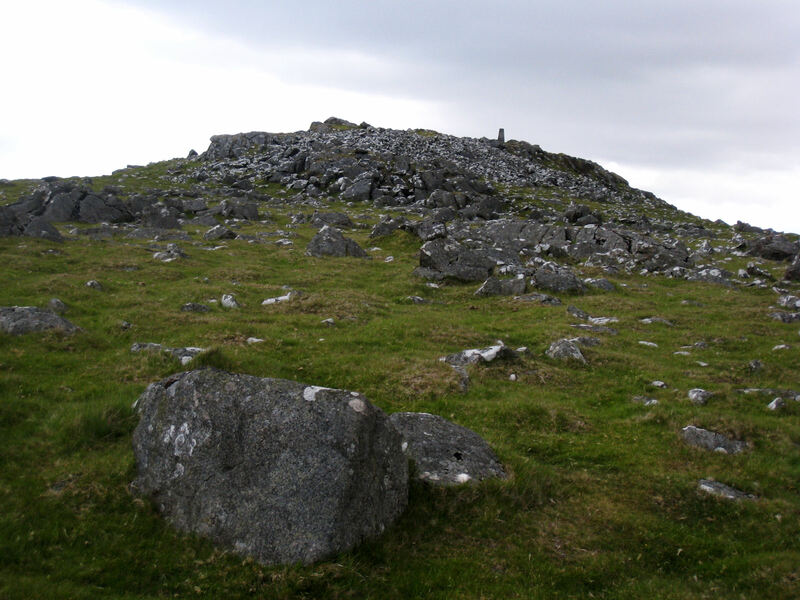 As we approached the summit of the tor, our luck changed. In fact, we began finding letterboxes under every other rock, it seemed. But there was a catch. These were not letterboxes in the normal sense. They were plastic containers of the usual types, but the contents came up lacking. Of about 15 boxes we found before we quit in disgust, not one had a stamp, not one was a registered Dartmoor box. These were apparently pseudo-letterboxes placed by kids for kids and most if not all probably never had a stamp, much like the new one we came across. It was simply a container with a pencil and small notebook with this message in a child's handwriting: "Hey, you found it! Box was put here by Chris, Sue and Rob. April 28, 2011"
So on our first day of letterboxing on Dartmoor, the mecca of letterboxing, which has been said to have thousands of letterboxes within its borders, we found.... (drum roll)... one box. One legitimate, viable letterbox in about four hours of searching. Definitely not what we expected. But the day certainly was not a total loss. We enjoyed some great exercise scrambling around the tors. And we might not have found letterboxes, but we found ponies! 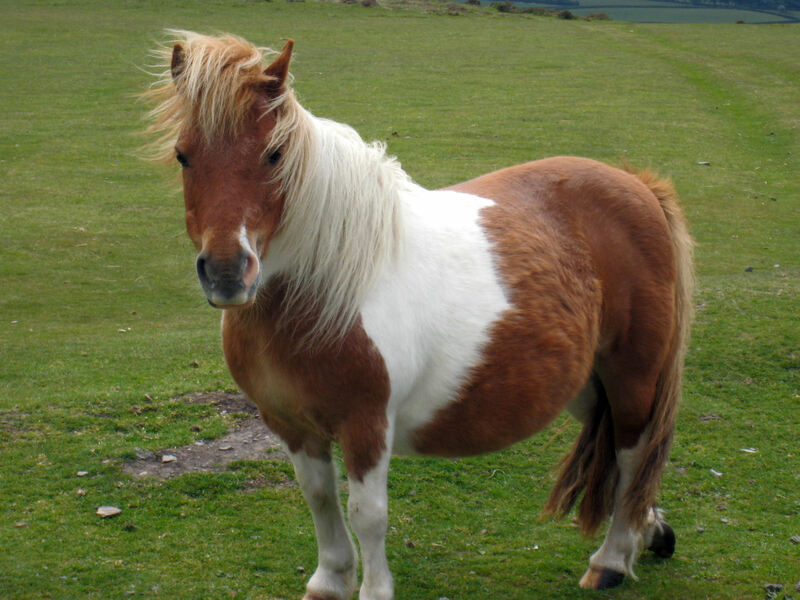 The Dartmoor Pony breed has lived in this area of southwest England for centuries. Because of its adaptation to the harsh weather on the moors, the Dartmoor is very hardy and in the past was used as a working animal in local tin mines and quarries. The park service tries to keep the ponies in a semi-feral state but park visitors often ignore posted regulations and feed the ponies. As a result, the ponies have become rather desensitized to humans and will approach people and cars to beg for food, as we learned first hand. Tomorrow we return to Dartmoor to try a couple of other tors. If we don't search, we definitely won't find.